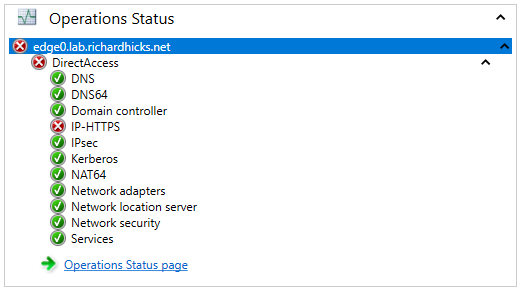 DirectAccess IP-HTTPS Not Working Properly in Windows Server 2019 | Richard M. Hicks Consulting, Inc.
After installing and configuring DirectAccess in Windows Server 2019 you may encounter an error message indicating that IP-HTTPS is not working properly. 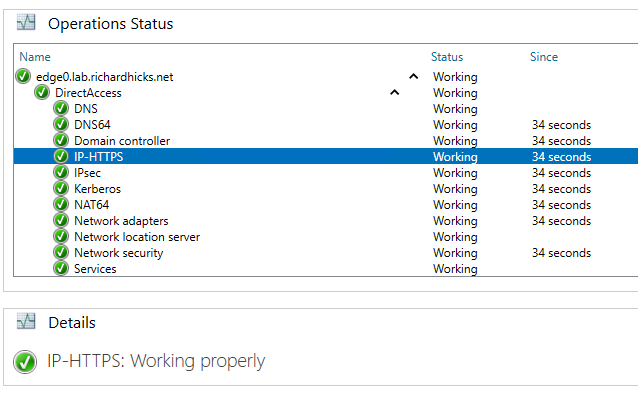 Looking at the Operations Status overview in the Dashboard of the Remote Access Management console shows that the IP-HTTPS interface is in error. Viewing the detailed Operations Status shows the following error message. Error: The IP-HTTPS route does not have published property enabled. 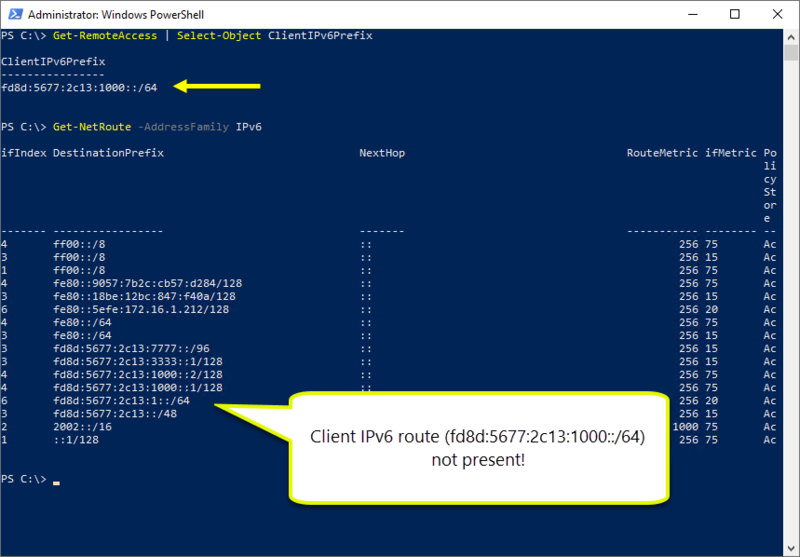 Looking at the routing table on the DirectAccess server reveals that a route to the client IPv6 prefix is indeed missing. 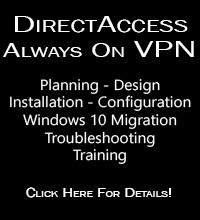 To resolve this error message, add the client IPv6 route to the DirectAccess server’s routing table and publish it. 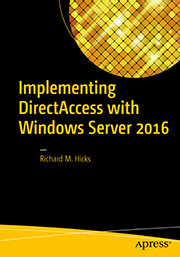 This is accomplished by running the following PowerShell commands on the DirectAccess server. 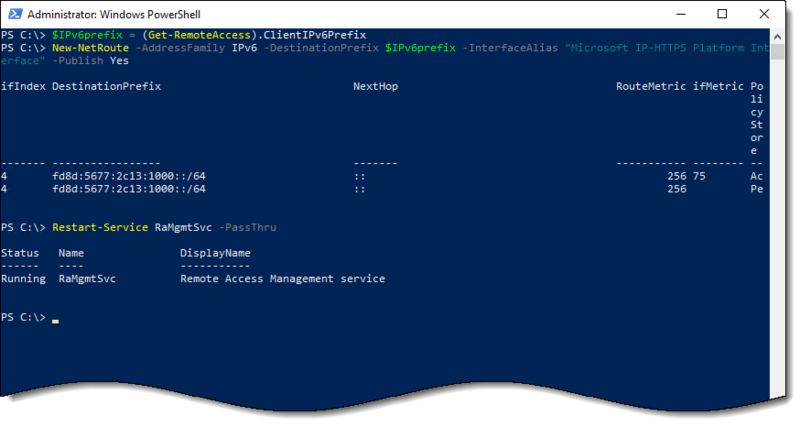 Next, restart the Remote Access Management service (RaMgmtSvc) using the following PowerShell command. Once complete, refresh the management console and the IP-HTTPS error message should be resolved and the operations status should state that it is now working properly. Hey Rich, this worked fine on our first DA server but for the second one in the cluster, the route adds but then removes itself when you restart RaMgmtSvc or the server. I can re-publish it but I cant get it to stick. Tried using PoSH and netsh, for some odd reason it’s removed when the service reboots, any idea? Thanks for the heads up. Suspected that might happen. I just did some quick testing with a single server and didn’t see any issues. For now you’ll have to keep re-applying the missing route until a fix is available. 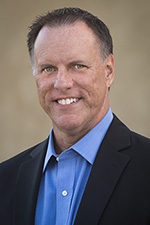 FYI, Microsoft is aware of the problem and working to address it. I’ll be sure to update the post when it’s available. I have the same problem, first server works perfect, but when I add the second one after reboot of RaMgmtSvc route disappears. Unexpected token ‘New-NetRoute’ in expression or statement.